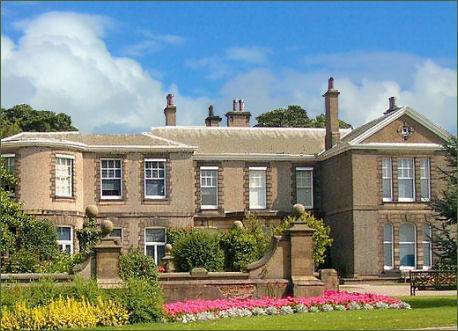 Lotherton Hall is a charming Edwardian country house near Aberford, Leeds. The hall was extensively reconstucted during the Victorian and Edwardian periods by Colonel Frederick Gascoigne, the oldest parts of the present building are believed to be the Regency core of the main house which is now the Boudoir and Medal Room. The hall houses a superb collection of objets d'art, which have been accumulated since the eighteenth century and are now on display to the public. On the ground floor of the north wing visitors can view the restored Servants' Rooms. There are several, mainly local exhibitions featured in the Servants' Hall each year. The Chapel, which is dedicated to St James, dates back to the twelfth century and once formed part of the medieval village of Luttrington. The original Norman doorway with its carved doorhead can be seen on the northern side of the building . This dates the chapel to between 1170 and 1180, during the reign of King Henry II.The building, which is grade II listed, has undergone some alterations from the eighteenth century and was restored in 1917. Lotherton Hall has been in continuous occupation since the seventh century and has been home to a number of influential families, including the Nevilles, most notably Archbishop George Neville, the younger brother of the famous Richard Neville, Earl of Warwick, later known to history as Warwick the Kingmaker and the de Hotham family, and finally the Gascoigne family, who originated from Gascony and are believed to have come to England at the time of the Norman conquest. In the decade of the 1540s, John Gascoigne of Lasingcroft purchased the lands surrounding the hall. The Hall itself was acquired by the Gascoigne family in 1825 when both the house and the park were purchased by Richard Oliver Gascoigne. Richard Trench Gascoigne acquired ownership of the house following the death of his aunt Elizabeth, wife of Lord Ashtown, in 1893. It became the main residence of the Gascoigne family after the death of Richard's father Frederick at Parlington Hall in 1905. During the First World War, the Hall was used as a V.A.D. hospital. It was granted for public access to the City of Leeds in 1968 by Sir Alvary Gascoigne and his wife, last of the Gascoigne family. The house is situated on part of the Gascoigne estate, the estate is now home to an extensive collection of endangered bird species and a herd of red deer. Housing over 480 individual birds, from more than 130 different species, the Bird Garden has developed into one of Britain's premier collections of rare and endangered birdlife. The hall is surrounded by attractive formal, wildflower and wooded grounds. The impressive gardens cover 8 acres surrounding the front aspect of the hall. 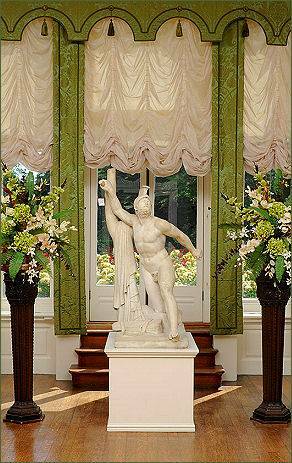 They were mainly designed by Gwendolyn Gascoigne between 1903 and 1949. There is also an adventure playground with equipment for all ages and mobility levels, and picnic areas and nature trails. Behind the Hall itself a further field is often used to host shows.